Olive Oil- ~1 1/2 Tbs. Heat oil in large skillet over medium-high heat. 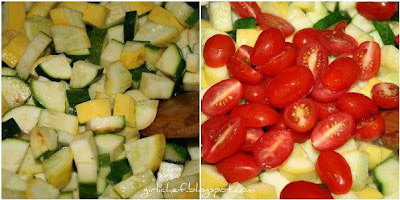 Add zucchini, summer squash & garlic. Cook until just tender. Add tomatoes and stir until they just release their juices, ~2 minutes. 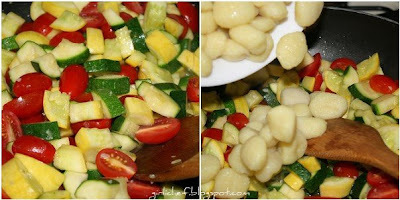 Cook gnocchi according to package/recipe directions. Drain, reserving 1 c. cooking liquid. 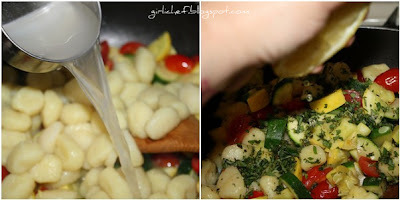 Add gnocchi to skillet and toss. Chop up your herbs. Add reserved cooking liquid. Remove from heat and stir in chopped herbs, butter and lemon juice. 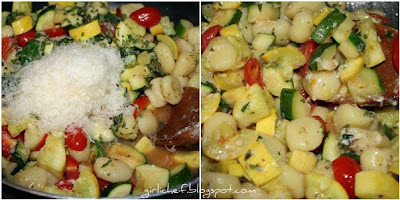 Stir in parmesan & season to taste with salt and pepper. 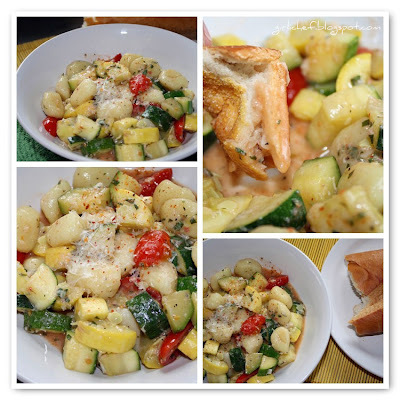 Serve with extra parmesan for sprinkling and a loaf of Pane Rustico for sopping up the juices.